Psoriatic arthritis (PsA) is a unique, clinically heterogeneous type of inflammatory arthritis associated with skin psoriasis. Psoriatic arthritis affects the joints as well as surrounding structures such as the tendon area that inserts onto bone (enthesitis), tenosynovitis of the entire digits (dactylitis), or it can cause nail changes such as pitting or onchonylysis . 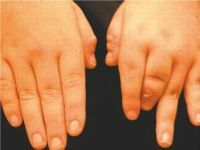 These disease manifestations distinguishes it from other types of inflammatory arthritis such as rheumatoid arthritis. Symptoms commonly overlap with to some degree with several other conditions including axial involvement or IBD associated arthritis, which together form a family of diseases termed seronegative spondyloarthritis. Early diagnosis and treatment can relieve pain and inflammation, which may achieve disease remission and prevent progressive joint involvement and damage. Genetic factors play a role, as evidenced by the presence of a strong familial association and links with several major histocompatibility complex (MHC) class I alleles. Up to 40% of patients with PsA have a positive family history of psoriasis or arthritis. The severity and course of PsA varies, ranging from mild symptoms to severe irreversible inflammatory joint destruction. Many patients initially present with oligoarthritis (one to four joints) then progress to polyarticular (five or more joints) involvement. Aggressive disease is more common in patients who exhibit polyarticular or erosive PsA at presentation, extensive skin involvement, strong family history of psoriasis, and disease onset before 20 years of age. Multiple factors contribute to the pathogenesis of PsA, including genetic, environmental, and immunologic factors. The exact cause has not been identified, and the concomitant pathogenic connection between the skin and joints is not clear. There is evidence that activated T cells are present in both skin and joint tissue. It is likely that cytokines such as the tumor necrosis factor (TNF)-alpha play a role in guiding the inflammatory process that leads to cartilage and bone degradation as well skin inflammation. Proinflammatory cytokines involved with skin and joint disease also may be linked to adverse cardiovascular and metabolic outcomes associated with PsA. Patients with PsA present with pain, swelling, stiffness, and tenderness of the joints, limiting motion. The disease has a heterogeneous presentation including monoarthritis, oligoarthritis, or polyarthritis as well as spondylitic variants. There is a growing awareness that some patients with PsA have an axial component to their disease, primarily affecting the spine, hips, and shoulders. Five different subtypes of PsA have been described (Table 1), and they can overlap. Most patients present with monoarthritis or asymmetric oligoarthritis. Some can present with a symmetric arthritis similar to rheumatoid arthritis and some may have predominantly the axial or spondylitis joints affected. Arthritis mutilans is a more rare, painful, and rapidly destructive type of PsA characterized by deforming arthritis, especially of the hands, and by resorption of phalangeal bones. Table 1: Psoriatic arthritis: Subtypes. Other associated musculoskeletal features include enthesitis and dactylitis (Figure 1). Dactylitis, which usually presents as a sausage-like inflammation of the entire finger or toe, is a hallmark feature of PsA, although it is also seen in other spondyloarthropathies including reactive arthritis. Enthesitis, or inflammation at the tendon or ligament insertion into bone, is a common feature of spondyloarthropathies, including PsA. Common presentations of enthesitis include the Achilles tendon insertion site and the plantar fascia insertion to the calcaneus. Inflammation of the eye, which is seen more frequently in males who are also HLAB27 positive, can also be associated with PsA. Cutaneous psoriasis usually precedes the onset of joint symptoms. Skin changes may not be reported by the patient, requiring scrutiny of hidden areas such as the scalp, umbilicus, ears, and perianal skin areas. Psoriatic nail pitting and onycholysis (Figures 2 and 3) are additional features often correlated with distal interphalangeal joint involvement. The diagnosis of PsA is primarily established by the presence of characteristic signs and symptoms in both the skin and joints. There are no laboratory test values that will provide a definitive diagnosis. Given the heterogeneity of disease presentation, diagnosis can be complex. Classification criteria have been introduced to help diagnose PsA. The Classification of Psoriatic Arthritis (CASPAR) criteria provide a simple and highly specific assessment tool for PsA. The diagnosis requires patients to have inflammatory arthritis plus at least three points from a list of disease manifestations in order to classify them into the PsA group (Table 2). Table 2: Classification criteria for PsA. Classification criteria for axial and peripheral spondyloarthropathy have been developed by the Assessment of SpondyloArthritis International Society (ASAS) criteria. Both classification sets include the presence of psoriasis, and there is overlap between the two. The presence of inflammatory arthritis, inflammatory back pain, enthesitis, uveitis, family history, and radiographic abnormalities should prompt evaluation for PsA. It is important to diagnose PsA early so that treatment can quickly relieve pain and inflammation and prevent irreversible joint damage. PsA should be distinguished from other inflammatory arthropathies such as rheumatoid arthritis (RA.) Enthesitis, dactylitis, and distal interphalangeal (DIP) involvement help differentiate PsA from RA. Other spondyloarthropathies, including ankylosing spondylitis, reactive arthritis, and enteropathic arthritis may have similar clinical presentations. Crystal-induced arthritis can coexist with PsA, but it can be distinguished from PsA by synovial fluid crystal analysis. Dermatologists can help confirm psoriasis and to comanage therapeutic decisions for both skin and joint involvement. A classic x-ray pattern of bony proliferation can be seen and later bony erosion and resorption may present as a "pencil in cup" deformity of the interphalangeal joints. Ultrasound and MRI may reveal joint and tenosynovial inflammation. Absence of rheumatoid factor is an important distinguishing factor for differentiating PsA from rheumatoid arthritis. New onset PsA can be triggered by HIV infection, therefore all patients should be considered HIV testing especially with those with risk factors. Acute phase reactants such as erythrocyte sedimentation rate and C-reactive protein (CRP) may be elevated but are often in normal ranges, even with active joint disease. Presence of the genetic marker HLA-B27 identifies patients at higher risk of developing PsA. Laboratory tests to consider when trying to identify an underlying systemic inflammation or other types of inflammatory-related conditions or to exclude some related conditions are below. The tests are not diagnostic by themselves. Treatment goals are to reduce symptoms, improve and maintain joint function and to keep the inflammatory burden low, with the overall goal of maximizing patients' long-term function and quality of life. Recent GRAPPA guideline for treatment is being tailored according to the predominate domains of the disease affected. In addition to medical therapy, there is a strong role for early physical and occupational therapy to optimize function. Treatment guidelines from the Group for Research and Assessment of Psoriasis and Psoriatic (GRAPPA) categorize treatment by the disease domains: peripheral arthritis, skin and nail disease, axial disease, dactylitis, and enthesitis (see Table 3). Table 3: Treatment guidelines for PsA according to disease domains. Treat-to-target is a relatively new approach in the management of PsA that uses well-defined, clinically relevant physiologic targets as end points. In this approach, practitioners monitor disease activity and adjust therapy accordingly. Clinical trial data suggest that targeted control of PsA is associated with improved outcomes. [13,14] The goal is to achieve low disease activity in all disease domains. In addition, criteria for minimal disease activity have been developed to provide specific measures for measuring therapeutic outcomes. It defines a satisfactory state of disease activity and encompasses all aspects of the disease, providing a defined target for treatment. Nonsteroidal anti-inflammatory drugs (NSAIDs) can be beneficial for axial disease as well as for peripheral arthritis, dactylitis, and enthesitis. They are widely used as initial medications and can be used intermittently. Because PsA increases the risk of cardiovascular (CV) events, it is important to be aware of this risk with chronic NSAID use in PsA patients. Glucocorticosteroids should be used with caution. In additional to other adverse effects, flares of cutaneous psoriasis after steroid use have been documented. When used, the drugs should be slowly tapered to prevent cutaneous psoriasis flares during steroid withdrawal. Intra-articular injection is recommended over systemic formulations to reduce the risk of flares associated with steroid discontinuation. The most widely used disease-modifying antirheumatic drug (DMARD) is methotrexate (MTX). Improvement in cutaneous psoriasis is well documented with MTX. The suggested dose for MTX in a patient with PsA is 15 to 22.5 mg orally weekly. Folic acid at 1 mg daily is recommended to reduce the risk of side effects such as gastrointestinal upset, mouth sores, low blood cell counts, and abnormal liver function. Alcohol consumption should be avoided with MTX, as both are cleared through the liver. Although benefits with MTX have been observed in many studies and in clinical practice and MTX is recommended as a first-line therapy for peripheral PsA, no randomized controlled trial (RCT) has documented improvement over placebo in the primary response endpoint. Sulfasalazine has been shown to be effective in treating peripheral joint symptoms, although it has less effect on skin and axial disease symptoms in PsA. Other traditional DMARDs for inflammatory arthritis have been used in PsA patients, including azathioprine, leflunomide, and cyclosporine. However, only small RCTs with small numbers of PsA patients have been completed with these agents. These treatments are generally reserved for patients who appear to be intolerant of other therapies or have milder disease manifestations. Targeted biological therapy for autoimmune disease has significantly improved PsA treatment outcomes, especially treatment targeted against TNF-alpha. These TNF inhibitors are effective for both skin and joint involvement and have been shown to prevent radiographic damage. Five TNF inhibitors are FDA approved to treat PsA (Table 4). Table 4: List of drugs available to treat psoriatic arthritis. Safety and efficacy profiles are similar for these medications. Concomitant use of MTX does not significantly affect responses, but there appears to be less discontinuation of biologic medications when used with MTX. 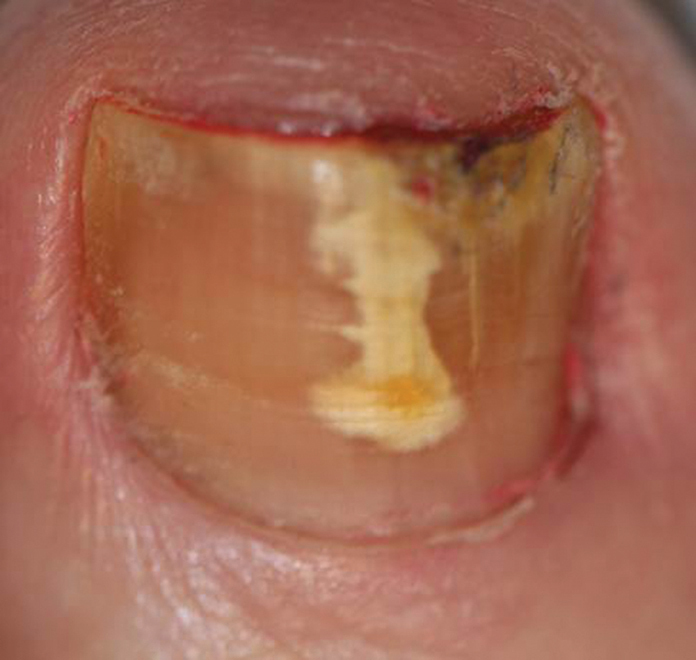 Treatment with TNF inhibitors has been associated with improvement of dactylitis, enthesitis, and axial disease. Given the lack of efficacy with MTX for these conditions, treatment with TNF inhibitors may be considered instead of traditional DMARDS. Data on their treatment of dactylitis and enthesitis are limited. Common adverse events associated with biologic DMARDs include injection site reactions (usually self-limiting), increased upper respiratory illness, and, less commonly, a lupus-like syndrome. Rare but significant adverse effects include serious opportunistic infections, such as tuberculosis. New demyelinating disease also has been reported. Paradoxically, TNF inhibitors have been linked to de novo or worsening psoriasis, particularly palmoplantar pustulosis. In patients who have an inadequate response to the initial TNF inhibitor, they can be switched to a second TNF inhibitor or to another biologic class. Currently, three other biologics are FDA approved for PsA. Ustekinumab (Stelara) is an IL-12/23 inhibitor that is dramatically effective for plaque psoriasis. Ustekinumab is efficacious for PsA in both treatment-naive patients as well as in patients whose disease has not responded to TNF inhibitor therapy. Apremilast (Otezla), a phosphodiesterase 4 (PDE4) inhibitor, appears to be effective for PsA with a relatively minor side effect profile; however, it is associated with an increased risk of depression. Secukinumab (Cosentyx), an interleukin (IL)-17A inhibitor, was FDA approved for PsA in January 2016. It has shown efficacy in reducing signs and symptoms of PsA. Other emerging therapies include drugs FDA approved for psoriasis that are being investigated for PsA. In cases of advanced disease, joint replacement surgery may be needed to correct severe joint destruction. Treatment guidelines have been issued by the European League Against Rheumatism (EULAR) and the Group for Research and Assessment of Psoriasis and Psoriatic Arthritis (GRAPPA). [17,19] These guidelines are helpful to tailor treatment into domains. Females with PsA who are of childbearing age with family planning issues must avoid methotrexate and leflunomide. The TNF-inhibitors have been used in pregnancy, particularly during the first two trimesters. Certolizumab is a pegylated fragment of an anti-TNF alpha monoclonal antibody, and studies suggest that it is not readily transported across the placenta. [22,23] In females of childbearing age, these risks must be weighed against the adverse effects of unchecked inflammation if immune-suppressing medications are discontinued. Rates of obesity and metabolic syndrome are elevated in patients with PsA. In these patients, steatohepatitis must be considered as a risk factor for hepatotoxicity when considering methotrexate use. Patients with psoriasis and PsA have an increased prevalence of CV risk factors and greater risk for ischemic CV events. Correction of modifiable CV risk factors as well as control of inflammation may improve outcomes. Patients with PsA are at elevated risk of infection, particularly when taking an immunosuppressant. Clinicians need to check their vaccination status, and vaccinations such as herpes zoster should be administered prior to initiating biologic DMARD therapy. Psoriatic arthritis should be suspected in patients with or without cutaneous psoriasis who present with clinical features of joint synovitis, dactylitis, enthesitis, or nail changes. Classifications have been introduced and validated in larger PsA cohorts. Treatment options continue to expand, providing practitioners additional options to achieve the target of disease remission. PsA is a complex, systemic diseases; prevalence estimates indicate that approximately 1% of the US population has PsA. The greatest risk factor for PsA is psoriasis; hereditary factors also increase the risk as up to 40% of patients have a positive family history of psoriasis or arthritis. PsA can affect both the skin and joints but not necessarily at the same time, and it can affect any joint in the body. PsA should be suspected in patients with dactylitis, enthesitis, nail changes, and/or spondylitis, especially in those with psoriasis. There is no definitive laboratory test or x-ray evidence for diagnosis; thus, diagnosis is primarily established by signs and symptoms in the skin and joints. The goal of PsA treatment is to maximize long-term function and quality of life by controlling symptoms and reducing inflammation to achieve the treatment target of disease remission or low disease activity. Treatment focuses on predominant disease domains and organ involvement—peripheral arthritis, axial disease, dactylitis, enthesitis, and skin and nail disease. The relatively recent approvals of TNF alpha inhibitors and other biologic DMARDs have significantly improved outcomes for skin and joint involvement, providing expanded therapeutic choices for PsA. The concept of treat to target has been adapted to PsA with studies showing that tight control of disease can improve outcomes. Criteria for minimal disease activity have been developed to provide specific measures for identifying therapeutic outcomes of low disease activity. Gladman DD, Antoni C, Mease P, Clegg DO, Nash P. Psoriatic arthritis: epidemiology, clinical features, course, and outcome. Ann Rheum Dis 2005; 64(Suppl II):ii14–ii17. Ogdie A, Weiss P. The epidemiology of psoriatic arthritis. Rheum Dis Clin North Am 2015; 41:545–568. Eder L, Haddad A, Rosen CF, et al. The incidence and risk factors for psoriatic arthritis in patients with psoriasis: a prospective cohort study. Arthritis Rheumatol 2016; 68:915–923. Chandran V, Raychaudhuri SP. Geoepidemiology and environmental factors of psoriasis and psoriatic arthritis. J Autoimmun 2010; 34:J314–J321. Alamanos Y, Voulgari PV, Drosos AA. Incidence and prevalence of psoriatic arthritis: a systematic review. J Rheumatol 2008; 35:1354–1358. Fitzgerald O, Winchester R. Psoriatic arthritis: from pathogenesis to therapy. Arthritis Res Ther 2009; 11:214. Gladman DD. Early psoriatic arthritis. Rheum Dis Clin North Am 2012; 38:373–386. Wilson FC, Icen M, Crowson CS, McEvoy MT, Gabriel SE, Kremers HM. Incidence and clinical predictors of psoriatic arthritis in patients with psoriasis: a population–based study. Arthritis Rheum 2009; 61:233–239. Queiro R, Torre JC, Belzunegui J, et al. Clinical features and predictive factors in psoriatic arthritis-related uveitis. Semin Arthritis Rheum 2002; 31:264–270. Taylor W, Gladman D, Helliwell P, et al. Classification criteria for psoriatic arthritis: development of new criteria from a large international study. Arthritis Rheum 2006; 54:2665–2673. Rudwaleit M, van der Heijde D, Landewe R, et al. The development of Assessment of SpondyloArthritis international Society classification criteria for axial spondyloarthritis (part II): validation and final selection. Ann Rheum Dis 2009; 68:777–783. Morar N, Willis-Owen SA, Maurer T, Bunker CB. HIV-associated psoriasis: pathogenesis, clinical features and management. Lancet Infect Dis 2010; 10:470–478. Schoels MM, Braun J, Dougados M, et al. Treating axial and peripheral spondyloarthritis, including psoriatic arthritis, to target: results of a systematic literature search to support an international treat-to-target recommendation in spondyloarthritis. Ann Rheum Dis 2014; 73:238–242. Coates LC, Moverley A, McParland L, et al. Effect of tight control of inflammation in early psoriatic arthritis (TICOPA): a multicentre, open-label, randomised controlled trial [abstract]. Lancet 2014; 383:S36. Coates LC, Kavanaugh A, Mease PJ, et al. Group for Research and Assessment of Psoriasis and Psoriatic Arthritis 2015 treatment recommendations for psoriatic arthritis. Arthritis Rheumatol 2016; 68:1060–1071. Coates LC, Fransen J, Helliwell PS. Defining minimal disease activity in psoriatic arthritis: a proposed objective target for treatment. Ann Rheum Dis. 2010; 69:48–53. Ritchlin CT, Kavanaugh A, Gladman DD, et al, for the Group for Research and Assessment of Psoriasis and Psoriatic Arthritis (GRAPPA). Treatment recommendations for psoriatic arthritis. Ann Rheum Dis 2009; 68:1387–1394. Fagerli KM, Lie E, van der Heijde D, et al. The role of methotrexate co-medication in TNF-inhibitor treatment in patients with psoriatic arthritis: results from 440 patients included in the NOR-DMARD study. Ann Rheum Dis 2014; 73:132–137. Gossec L, Smolen JS, Gaujoux-Viala C, et al. European League Against Rheumatism recommendations for the management of psoriatic arthritis with pharmacological therapies. Ann Rheum Dis 2012; 71:4–12. Husni ME, Qureshi AA, Koenig AS, Pedersen R, Robertson D. Utility of the PASE questionnaire, psoriatic arthritis (PsA) prevalence and PsA improvement with anti-TNF therapy: results from the PRISTINE trial. J Dermatolog Treat 2014; 25:90–95. Coates LC, Aslam T, Al Balushi F, et al. Comparison of three screening tools to detect psoriatic arthritis in patients with psoriasis (CONTEST study). Br J Dermatol 2013; 168:802–807. Forger F, Zbinden A, Villiger PM. Certolizumab treatment during late pregnancy in patients with rheumatic diseases: low drug levels in cord blood but possible risk for maternal infections. A case series of 13 patients. Joint Bone Spine 2016; 83:341–343. Clowse ME, Wolf DC, Forger F, et al. Pregnancy outcomes in subjects exposed to certolizumab pegol. J Rheumatol 2015; 42:2270–2278. Ash Z, Gaujoux-Viala C, Gossec L, et al. A systematic literature review of drug therapies for the treatment of psoriatic arthritis: current evidence and meta-analysis informing the EULAR recommendations for the management of psoriatic arthritis. Ann Rheum Dis 2012; 71:319–326. Coates LC, Navarro-Coy N, Brown SR, et al. The TICOPA protocol (TIght COntrol of Psoriatic Arthritis): a randomised controlled trial to compare intensive management versus standard care in early psoriatic arthritis. BMC Musculoskelet Disord 2013; 14:101. Fagerli KM, Lie E, van der Heijde D, et al. Switching between TNF inhibitors in psoriatic arthritis: data from the NOR-DMARD study. Ann Rheum Dis 2013; 72:1840–1844. Gelfand JM, Gladman DD, Mease PJ, et al. Epidemiology of psoriatic arthritis in the population of the United States. J Am Acad Dermatol 2005; 53:573–577. Gladman DD, Helliwell PS, Khraishi M, Callis Duffin K, Mease PJ. Dermatology screening tools: project update from the GRAPPA 2012 annual meeting. J Rheumatol 2013; 40:1425–1427. Husni ME, Mease PJ. Managing comorbid disease in patients with psoriatic arthritis. Curr Rheumatol Rep 2010; 12:281–287. Mease P. Psoriatic arthritis and spondyloarthritis assessment and management update. Curr Opin Rheumatol 2013; 25:287–296. Ritchlin C, Rahman P, Kavanaugh A, et al; PSUMMIT 2 Study Group. Efficacy and safety of the anti-IL-12/23 p40 monoclonal antibody, ustekinumab, in patients with active psoriatic arthritis despite conventional non-biological and biological anti-tumour necrosis factor therapy: 6-month and 1-year results of the phase 3, multicentre, double-blind, placebo-controlled, randomised PSUMMIT 2 trial. Ann Rheum Dis 2014; 73:990–999. Ritchlin C. Psoriatic disease--from skin to bone. Nat Clin Pract Rheumatol 2007; 3:698–706. Saad A, Symmons, D, Noyce P, Ashcroft D. Risks and benefits of tumor necrosis factor-α inhibitors in the management of psoriatic arthritis: systematic review and meta-analysis of randomized controlled trials. J Rheumatol 2008; 35:883–890. Smolen JS, Braun J, Dougados M, et al. Treating spondyloarthritis, including ankylosing spondylitis and psoriatic arthritis, to target: recommendations of an international task force. Ann Rheum Dis 2014; 73:6–16. This chapter is updated from the August 2010 Disease Management chapter on Psoriatic Arthritis by M. Elaine Husni, MD, which was revised from the original chapter written by Michael Lucke, MD. Dr. Husni has disclosed royalty for the PASE questionnaire and consulting and membership on advisory committees or review panels for AbbVie, Amgen, UCB, Eli Lilly, Novartis, and Janssen.